With an aim to improve evidence-based neurorehabilitation practice, an affiliation between NeuroRehabilitation (NRE) and Cochrane Rehabilitation was announced in 2018, with the introduction of a new section in the journal called Cochrane Corners. 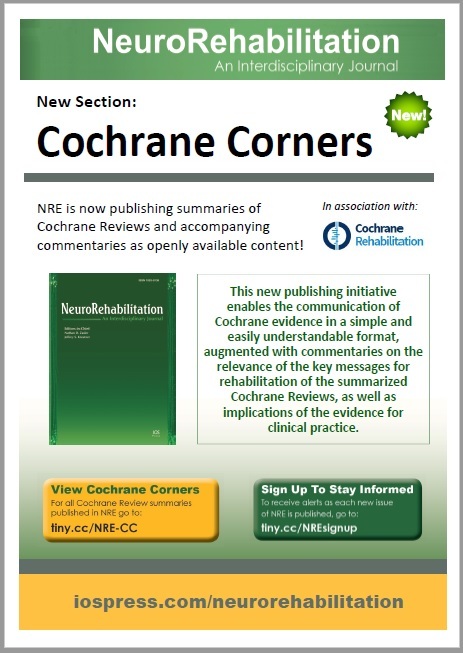 NRE Editors-in-Chief Jeffrey S. Kreutzer, PhD, and Nathan D. Zasler, MD, will select relevant neurorehabilitation Cochrane Reviews, and subsequently members of Cochrane Rehabilitation and/or rehabilitation professionals will develop the content for Cochrane Corners. All published content – exclusive to NRE – will include summaries of Cochrane Reviews and accompanying commentaries, which will undergo peer review and be openly available upon publication. For further details, see the editorial announcing the news here; and read the press release here.